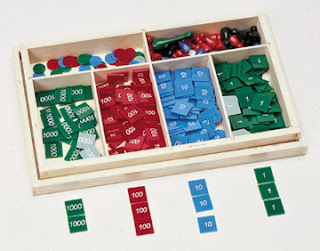 Cindy, over at love2learn2day, runs a weekly blog hop on elementary level math. This week's topic is multiplication and division. I'm writing this post to gather a few resources I like. Most of the posts that usually gather in the blog hop are activities. Before we get to activities, we might want to ask ourselves some questions, like "What is multiplication?" Multiplication can be modeled in many ways, and it's important to give young kids a chance to think about it through lots of different frameworks. Your own conceptions of multiplication may grow as you think about it. One resource that will help you broaden your perspective on multiplication (along with a number of other math topics) is the lovely book Moebius Noodles. (It's $15 for the paperback version, and whatever you decide to pay for the pdf version.) It is full of activities to share with young kids. 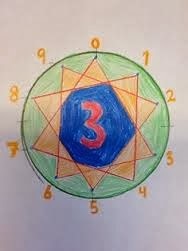 I also love the art connection made by Waldorf schools, with their multiplication stars. Beauty helps us love what we're doing, which helps us learn. Five-and-a-half-year-old Roland came to ask if he could multiply 8,696 times 10 using the stamp game. I was thrilled to see his interest in math taking off again after an unfortunate temper tantrum with the addition blank chart. I suggested he borrow a stamp game box from another classroom to supplement the one we have in ours, and he got started. I waited eagerly for him to arrive the next morning, looking forward to the moment when he would put AAAAAALLLLLL those tiles together in neat rows by category, and he would have to exchange several times (not to mention his surprise at seeing all the units disappear when multiplying by ten). My heart sank. Oh no, Dad! You robbed your son of such a cool experience! He was getting ready to see what ten times 8,696 looks like, and would have discovered the process that takes place during multiplication. He won’t be doing multiplication tables for at least two more years in public school - the answer doesn’t matter yet, but the process could have really taught him something valuable. Try some of the games at Math Playground. 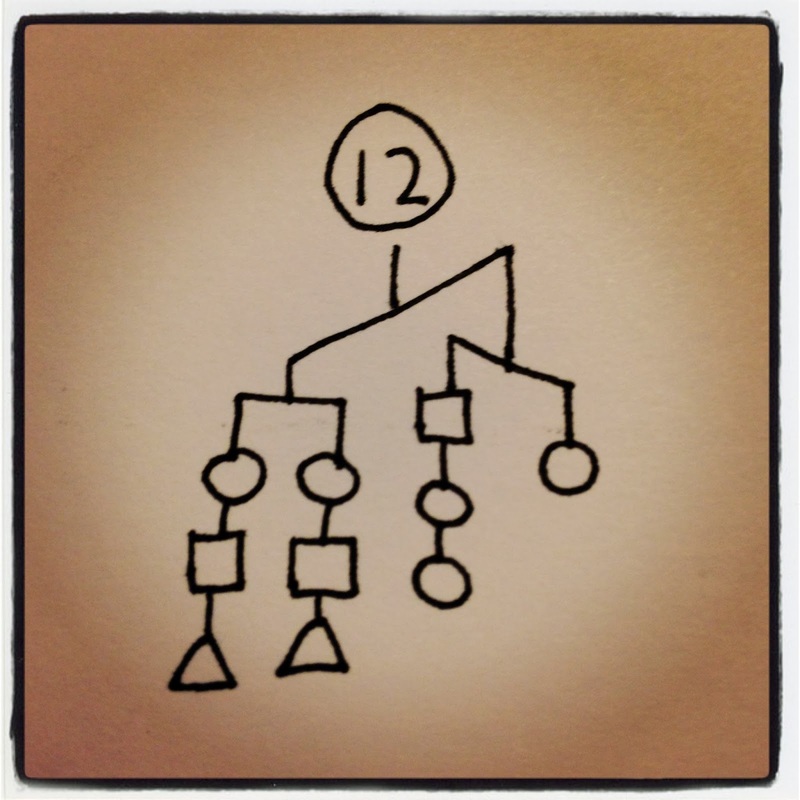 Use these flash cards, which help you visualize the numbers. Hmm, all of that and I haven't even mentioned division. I guess that will have to wait for its own post. Can't keep up with the good articles I'd like to read. The De Morgan Forum pointed me to an article by Liping Ma, whose writing always gets me thinking. I think some day I'll want to explore the tools available at SageMath. Megan's thoughts on ranking tasks as a way to get students to grapple with definitions. Hmm, I wonder if I could design a good activity for my calculus or linear algebra courses. The link takes you to an illustration of adding cubes, but the page that's on is a huge collection of good problems. Kate's logic game, whose name has not been decided, looks great. I'd use it in Discrete Math. Reminds me of an old game called WFF 'n Proof. On inventing number systems (with third graders). I used to share links more often. I used to write substantive blog posts more often, too. Since I've been writing less, I haven't been comfortable sharing lots of links. Didn't want this blog to descend into just a link-share. But it would be helpful to me to have them here. So maybe I'll start sharing my almost daily finds, even if it's not exciting for y'all. What is a radian? Here's Sam's colleague's applet (on geogebratube). These were the tabs I've kept open - some for weeks - hoping to figure out how to use some, how to find time to really process others. I am enjoying two online conversations right now. Students don't like to write about their reasoning. They don't present their work in a way that allows anyone else to comprehend their path to a solution. But we want kids to write about their reasoning. Conflict! Drama! Why do kids hate writing about math? I am currently trying to grade my students arguments (as prosecutors) for the murder mystery. Some of them really got into it. Most still didn't explain the math well. My take on this is that students will write (maybe even well) if we give them a good enough context. In the other conversation, Mr. Honner blogged about what happens when you zoom in super far on Desmos, looking for the hole in a rational function. It gets a bit crazy. The conversation got more interesting for me when Alan Eliasen started explaining "interval arithmetic", which I had never heard of. I'm teaching four classes this semester, which is a lot for me. That's embarrassing to admit - I know most math bloggers are high school teachers, and teach way more hours a week than I do, with more responsibilities for their students. But for me it's a heavy load. So I'm not prepping as much as usual. I've taught calc and pre-calc dozens of times, so I can usually get by with winging it. And, once in a while, I'm able to conduct a better class by improvising than I ever could have with a tight plan. That's what happened yesterday in pre-calc. The day before that I had worked hard to get their tests graded, so in the morning I printed out the new unit sheet, and walked into class not particularly sure how I wanted to get us started. I had grabbed a problem from my computer, and asked them to start thinking about it while I handed back tests. 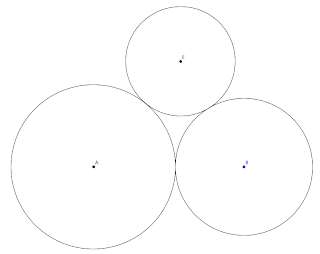 Consider three circles, all tangent (externally). Their radii are 4 in, 5in, and 6in. What is the area between them? 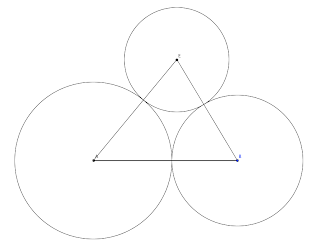 To find the area of the triangle, one student suggested drawing in the height. We drew it in, but couldn't yet see how to find its length. One of the students suggested that we could find the measures of the angles. They first suggested using law of sines. That didn't work, so we used law of cosines. 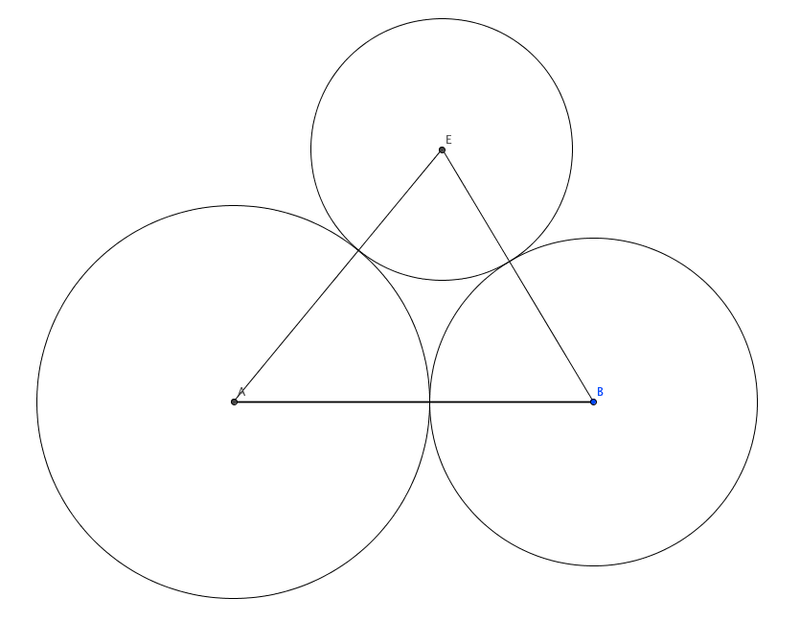 Sine of that angle gave the height over a triangle side, so we got the height, which gives us area of the triangle. Then we got the other angles and found the sector areas. The afternoon class did it without the height, so they got to use law of sines. It was a lot of steps for them, but it was a great review of the triangle trig we'd done earlier in the semester. And maybe they got a small taste of what problem-solving looks like. When we were done, I had just enough time to explain radians to the morning class. The afternoon class had more time, so we worked out the new circle-based definitions of the trig functions. What are our intuitions about temperature? I'm teaching exponential functions and logarithms in pre-calc right now. That means it's time to pull out my murder mystery, in which they will use logarithms to solve an important problem - which of their classmates killed John Doe? Since the murder mystery uses temperature to find the killer, I want to lead in with some thinking about how temperature changes over time. I also asked what temperature the batter was now. They told me room temperature, and we decided that was about 70 degrees. Then I drew axes on the board, labelled them, and asked the students to graph the temperature of the batter over time. Only one person (out of over 50 in the two classes) came close to the right shape. No one seems to have much intuition about how temperature changes. I did this once before, with the cooling coffee we always think about, and got slightly better results. The green one may have been influenced by our attention in the past week to exponential growth, while the purple one seems to have taken the exponential growth we were studying and limited it by the temperature of the oven. 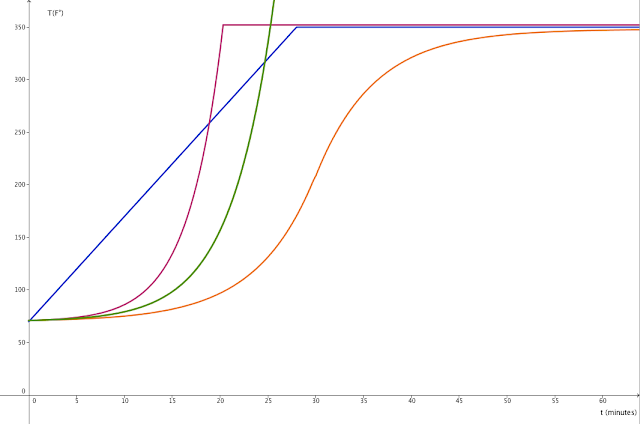 I have often seen students give a linear graph like the blue one, and a logistic-like graph like the orange one. No one wants stuff to heat up fast at first, and then slower. What makes their intuition bad here? Is there a physical experiment / demonstration we could do to improve their intuition? What would make exponential decay feel like the natural choice to them? Maybe cake is the wrong object to be heating? Please help me think about this. We see from the graph that the slope is positive until we reach the highest point, and after that it's negative. In fact, finding the highest point turns into finding out when the derivative (slope function) equals zero. This is a powerful tool for finding the most or least of anything that's defined as a function. The tangent line touches the graph at just one point. Using our equation for the curve, we can easily find the y-coordinate (height) at that point, but how would we find the slope? Slope requires finding the change in y and change in x, which takes two points. But all we have is one point. We're stuck. One strategy mathematicians use might be called wishful thinking. Since we need two points to find the slope, let's pretend we have them - let's cheat! If we use a second point on our graph very near the first, and make a line that goes through both points, our line, called a secant, is pretty close to the tangent line we're seeking. What if we try to get closer and closer this way? It was more than a hundred years later before mathematicians were able to develop a solid logical basis for calculus! But if we're willing to trust our intuition, like Newton did, this method of taking points "infinitely close" to one another works amazingly well. If we call the distance between the time values h, and imagine h getting smaller and smaller, we would say we're "taking the limit as h goes to 0". Here's where the logic gets tricky. We can't have zero on the bottom of the fraction (dividing by zero just doesn't work), but if h doesn't equal zero, no matter how close to zero it is, we can cancel it. What we're left with includes -16h, but h is so close to zero that this term doesn't really matter. 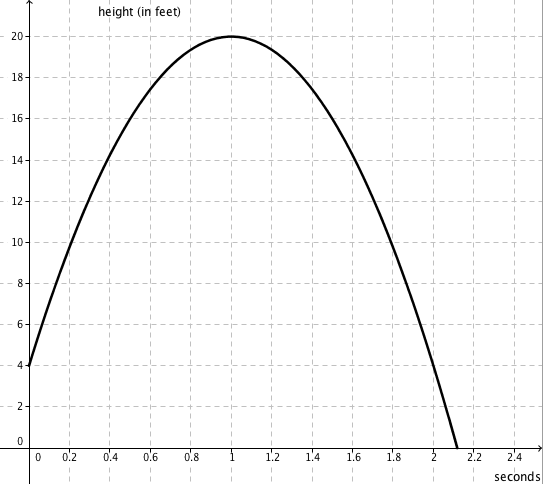 So we get that the slope is simply -32t+32 or 32(1-t). So the slope of the tangent line at time 0.4 is 21.6. We could also say that the ball is moving upward at that moment at 21.6 feet per second. Finding an average speed (I traveled 122 miles in 2 hours, for an average of 61 miles an hour) is straightforward. It's a ratio of distance traveled over the time it took. But finding an instantaneous speed - how fast I was going at a particular moment - that takes calculus. I think this is incredibly beautiful, and every semester I relish helping students understand this concept. But this is the first time I've written it all out without feedback from the 'students'. It's time to ask: "Any questions?" I’ll lay out a few of my own thoughts but I’m especially looking forward to learning from others on this. Let’s make differential calculus our puzzle for the week. He shares a delightful story of working in some very eccentric bakeries. Delightful though it was, I didn't feel like it would help anyone who didn't already get something about calculus. I want to offer up just a tiny bit of history, and then see if I can explain this for people who have at least a rudimentary understanding of algebra. Isaac Newton and Gottfried Leibniz both invented calculus at about the same time. That sort of thing happens often in math. I think if neither of them had been around, someone else would have invented the methods of calculus - the problems being investigated by scientists of the time were just crying out it for it. Planetary orbits, gravity, the paths of projectiles, the shapes of lenses for microscopes and telescopes - understanding any of these requires calculus. (See the first six pages of this book.) The time was ripe. Calculus mainly addresses two sorts of questions: How fast something is changing, and finding areas of irregular shapes. (The methods of calculus can also find volumes and the lengths of curves, among other things.) Addressing these questions requires dealing carefully with the notion of infinity, mostly what it might mean to be infinitely close and what an infinitely thin slice might mean. The Greeks (and probably others I don't know enough about) did some good work with these ideas. Even though they lacked the super-versatile tool of algebra, they made a good start on the area problem. Perhaps through lack of interest, they don't seem to have addressed the rate of change problem. Other cultures - and other individuals before Newton and Leibniz - made progress on both questions. What Newton and Leibniz did that got them famous was to find a simple link between the two, which is now called The Fundamental Theorem of Calculus. The rate of change questions are addressed by what's called 'differential calculus' and the area questions are addressed by what's called 'integral calculus'. Since the question asked in Numberplay was about differential calculus, we'll start there. Even though the ancients did more with areas, rates of change are where we start in calculus courses these days. In algebra, we talk about the slopes of straight lines like this. For every one unit you go over, you need to go up three units to stay on the line, so we say the slope is 3. (You might remember "rise over run" - that's part of the definition of the concept of slope.) Well, slope and rate of change are pretty similar ideas. Rate of change just gets a bit more precise about the story that goes with the graph. In this case, we're adding 3 loaves of bread per day to the pantry. The problem is, this notion of slope or rate of change only works with straight lines and constant rates of change, but most of the interesting things scientists want to study have changing rates of change. Like when we toss something into the air, and gravity pulls it back down. The methods of calculus helped Newton to understand how gravity affects objects, and it's a good place for us to start too. Suppose we throw a small ball straight up, and are able to measure its position perfectly every tenth of a second. We can make a graph for that, too. Like our bread graph, the horizontal axis will measure time, but now it will be in fractions of a second instead of in days. The vertical axis will simply measure the ball's height. It starts out in my hand, about 4 feet off the ground. I think I can throw it about 20 feet high. We'll imagine together that I do. Working out what gravity does to that ball is one of the things we can do with calculus. Here's the graph. (I don't like that I showed the curve for negative time values. I wonder if I can fix that.) I'll explain this one in part two. I mentioned Pythagorean triples to my pre-calc students last month, and told them if enough of them were interested, I would run a math circle on this topic. Ten of them signed up, six came the first week, and three came to the second and third sessions. It's small, but it's going very well, and I may do something bigger next semester. I love it when the way they approach a problem is different than the way I would have done it. X saw a pattern I had not seen before, and we explored her pattern at length in the second session. I haven't had time to write up the details, and have probably forgotten much of it. Maybe writing a list of all the perfect squares up to 400 will help us find more. One person was new, so we reviewed our first week's work for him. Another new person came, so we summarized for her. Then we explored triples where c = b+2. I love seeing their creativity and persistence. At the same time, I am blown away by the holes in their understanding of algebra moves. Y was considering (4n)2, and thought he might have to distribute. Not sure where we'll take it in Week Four, but eager to find out. I am still struggling to lead less, become less visible, and listen more. The Math Monday Blog Hop, at the love2learn2day blog, has a theme each week. This week, it's Geometry. At community college, we don't teach geometry as a course - not surprisingly, I feel it's my weakest area in math. So I love playing with games, puzzles, and problems that stretch me geometrically. My favorite geometry puzzle/game is Katamino, which makes a two-player game out of pentominoes (I blogged about it here). I love the beautiful wood pieces. (I can't tell if the newer versions are wood or plastic. I recommend trying to find the wood.) Playing with this will work your visualization skills. Online, I recently stumbled on a site which offers 40 challenge problems in compass and straightedge geometry, implemented in an online puzzle. I've recently come to love the Five Triangles blog, where mostly geometric problems are posted a few times a week. Their problems often challenge me to think in slightly new directions. What's your favorite way to play with geometry? I've been working on Playing With Math: Stories from Math Circles, Homeschoolers, and Passionate Teachers for almost five years now. For years I've been saying "It's almost done." I have sometimes felt bad about how long it has dragged out. I'm not sure if the authors (over thirty of them!) trust that the book will really get into print. It will. Last week I was perusing The World of Mathematics, by James Newman (a lovely four-volume mathematical encyclopedia), so I could write a description of it for my Book Picks section in Playing With Math. He mentioned in the preface that it took him fifteen years to put it together! Ok, now I don't feel so bad. I've been sending out little updates about my progress on my facebook page for Playing With Math, and mentioned that there today. If you'd like to follow my progress, please 'like' that page. Now I have something slightly bigger to say, which seems to fit better here on my blog. 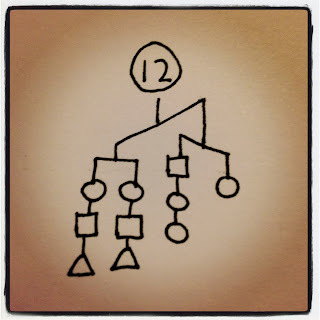 I'm working on answers to the puzzles Paul Salomon created - his Imbalance Problems. I am stuck on the last one we included. It may be that my brain is fried, and you'll all see an answer easily. But I just don't. This puzzle was created by one of Paul's fifth grade students, Felix. Can you solve it? Now I wish I had used these at the beginning of our inequalities unit in pre-calc. They really make you think about what > and < mean! I think I'll hand them out anyway - as a challenge. Maybe I'm slow, and you've all seen this sort of thing in action already, but my afternoon precalc class was a blast to watch in action today. I have 9 groups of 4, and gave each group a different word problem from the book. These were problems that needed the use of Law of Sines or Law of Cosines. They were to solve the problem and be ready to be the experts on it when others asked them for help. I helped the groups who needed help, and as groups were getting close to done, I told each group their next problem, and who their personal experts were. I loved seeing one person walk over to another group to get help for their group. I loved how hard they all worked. It was great. My morning class doesn't seem to get as engaged as this class, though. I'm trying to dream up a way to pull them in. I have heard, from a colleague who works with prospective elementary teachers, that many of them are not good at proportional thinking. My students (in pre-calc) seem to be fine at it, but ... they're using it even when it doesn't apply. My question for you is how to help them see why proportional reasoning is not always a sensible choice. 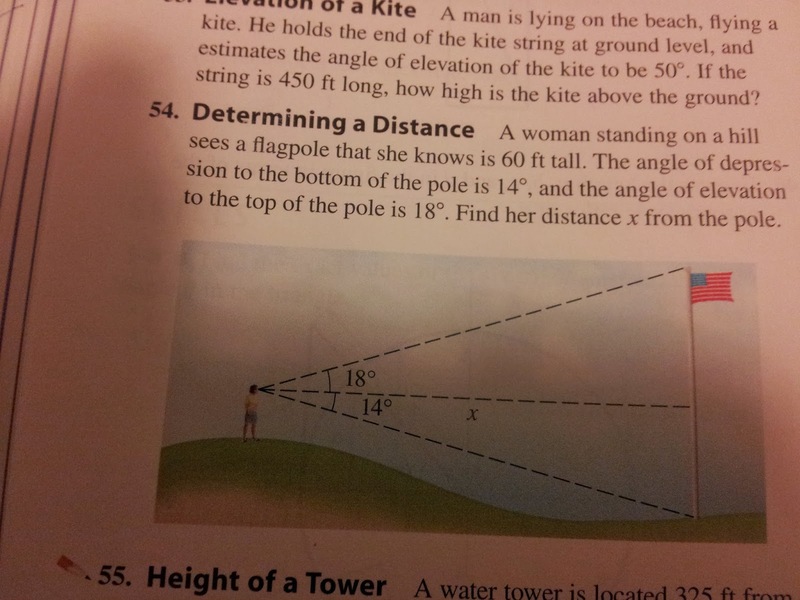 Problem #54. 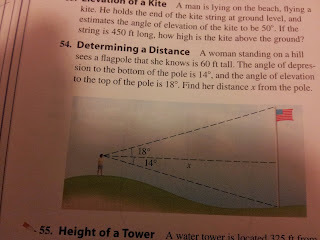 Determining a Distance: A woman standing on a hill sees a flagpole she knows is 60 feet tall [yeah, right]. The angle of depression to the bottom of the pole is 14 degrees, and the angle of elevation to the top of the pole is 18 degrees. Find her distance x from the pole. One student wanted to average the two angles at 16 degrees each. Another said the observer could stand on a stool to be a little higher, so the angles would be 16 degrees each. Their answers were very close. There were other good (but wrong) methods that all came down to assuming this relationship was linear in a way that it's not. Since their answers were very close, it was hard to help them see what was wrong with their reasoning. I love kids' books and I love math. So I've gathered together quite a collection. My son, who has gone to free schools where he isn't required to do math lessons, has probably gotten more math out of reading these books than he has from any formal math lessons. One of the earliest math skills, more basic perhaps than counting, is noticing attributes. 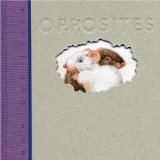 This book has no words, and yet it tells dozens of stories, each about opposites. Noticing the one attribute that shows opposites in the detail-filled pictures is a math game your child will want to play again and again. This is a board book, so it's good for the youngest child who will sit and listen to a story. And it stays good because it's so luscious. Great illustrations, fun rhythm and rhyme, cute story, and good mathematics. 7 ducklings are enjoying themselves in every combination. “Slipping, sliding, having fun, 7 ducklings, 6 plus 1.” (And then 5 plus 2, 4 plus 3, 3 plus 4, and so on.) It would be great to have a book like this for each number, showing all the number pairs that make it. If I ever get to teach math for elementary teachers again, I'd love to get my students to make books like this one. Everything I've seen by Mitsumasa Anno is delightful. There is so much to see in his books, many of which have no words. In this book, ten people are moving from one house to another. In each two-page spread you can see one more person who's moved from the left house to the right, along with lots of furniture and other small items. Anno's Mysterious Multiplying Jar will appeal to older readers. 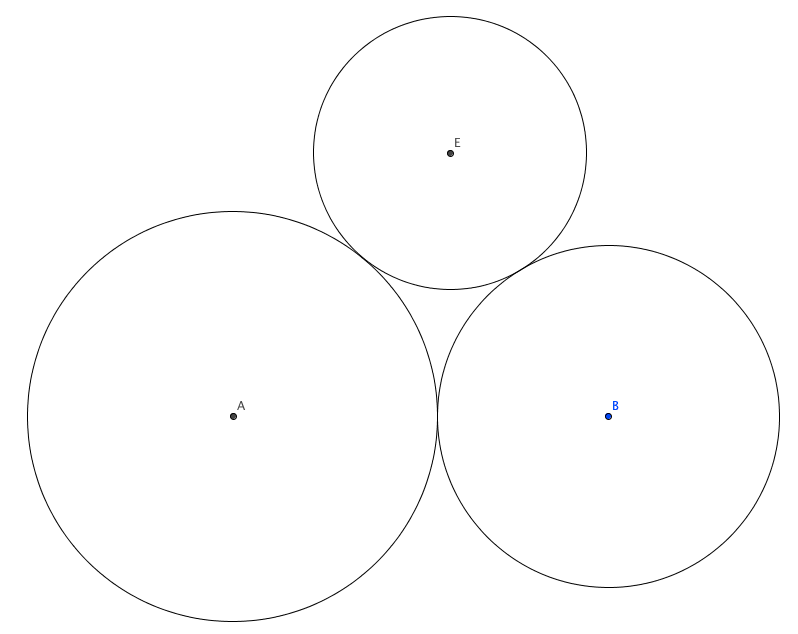 There is one island with two counties, which have three mountains each ..., until we get to ten jars within each box - a lovely, very visual representation of factorials. Anno's Magic Seeds does have words, and tells a fascinating story, of a plant whose seed, when baked, will keep you from being hungry for a full year. The plant grows two seeds in a year, and one needs to be used to grow a new plant... You may also enjoy Anno's Math Games. Anno has written over 40 books, most available in English. A poor old farming couple in China find a mysterious pot. When a hairpin drops in, they scoop two out.The math isn't discussed in the story, but it's pretty easy to add your own thoughts to this delightful tale of doubling. There are lots of great of great books on sharing equally. My favorite used to be The Doorbell Rang, by Pat Hutchins, but this one is even more delightful. The picnic starts with just two friends, rabbit is bringing 12 sandwiches and frog is bringing the bug juice. Monkey wants to come, "My mom just made cookies. I could take a dozen." They figure out how much of each goody each friend will get. In the end, there are 13 of them, and the sharing becomes more complicated. One of the delights of this book is the little icons showing who’s talking. Those would help kids to create a delightful impromptu play. The story starts when Zero knocks on the door of the Hotel Infinity. He’d like a room, but they’re all full (with the number One in Room One, and so on). Turns out that’s no problem. The cat who lives in the lobby gets confused - if the hotel is full, how can the numbers make room for zero just by all moving up one room? Things get worse when the fractions come to visit. This story is charming enough to entertain young children, and deep enough to intrigue anyone. Are you ready to learn about infinity with your 5 year-old? Each number from 1 to 100 is a monster, and each one gets its picture on its own page. All of the numbers (except poor 1) are made up from their prime parts. The pictures are colorful, full of intriguing detail, and amusing. The pages in the front and back that explain prime factorization are unassuming, waiting for the reader to decide it’s time to find out more. This and Powers of Ten would both make great coffee table books, to peruse over and over. Go to my Math Books page for reviews of chapter books for older kids (and books suitable for adults). 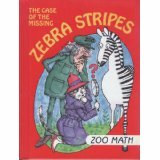 There are lots of other good mathy kids' books, but these are my favorites.